Michael E. Webber is amazing! I have found previous books on water to be one-sided, detailing problems without putting forward concrete solutions. 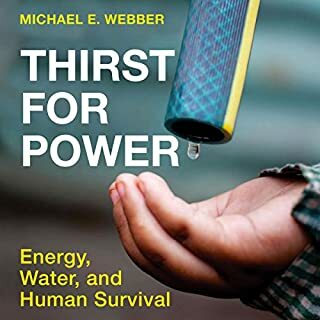 Michael Webber rigorously explores all aspects of the water-energy nexus, examining each angle objectively without judgement, and offering concrete solutions globally and as a consumer. I just ordered a hard copy so I can reference certain chapters and passages later. His language is clear and concise and he covers topics in a way that anyone can understand. He's my favorite professor that I never had! I love Michael Pollan and would rate Omnivore's Dilemma as one of my all-time favorite books. In this book, he drew on some of the same themes but sadly steered into giving health advice where he lacks expertise. The value for me was his take on health science in regard to nutrition over the past several decades and why health scientists continue to get it wrong. 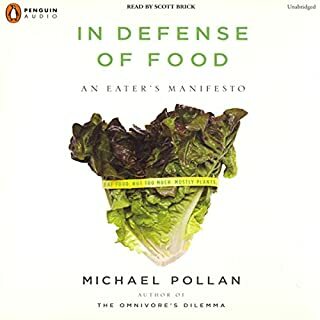 The narrator took on a haughty tone that I disliked but Pollan's content was well-researched and informative, particular as he tears apart what he calls "nutritionism" - deducing the value of various foods to specific components that may or may not contribute to our overall health. His argument draws heavily from Weston Price's decades-old wisdom that real food ecosystems bring peak health; not components of foods. Where he steers off course is his assessment that supplements are not needed as long as we eat real food, mostly plants. He actually says that people who take supplements are generally healthier because they value their health not because of the supplements they take. He makes no mention of junk supplements versus high quality supplements. He also fails to recognize the global rise in health problems as a result of the depletion of nutrients in our soil (instead; he blames poor health squarely on processed foods and the Western diet). There are plenty of super health-conscious people out there who still face major nutritional deficiencies because of genetic, gut, or other issues. In terms of whether supplements can help one's overall health and well-being, there are blood tests (real proof) -- as well as the patient's own change in health -- that show the value of certain supplements. In the end, he fell into his own trap of relying on mainstream medical community -- the very highly flawed culture of science he so readily criticizes -- to dole out over-simplified and unrealistic advice to his readers. This book highlights how bringing mindfulness and mindful practices, such as meditation and yoga, into your life can have profound effects on your physical well-being. This is not just a book for people who are ill. This is a book for anyone going through a period of heightened stress or suppressed health who wants to get to a better place emotionally and physically. Donna Jackson Nakazawa, a science writer and sufferer of multiple chronic illnesses, discusses how your Adverse Childhood Experience (ACE) score can make you more prone to chronic disease and health issues later in life. The score is based on emotional or physical abuse or other factors (death in the close family, separation from a parent, etc.) experienced as a child. The theory is that the higher the score, the more likely you are to eventually suffer from illness. 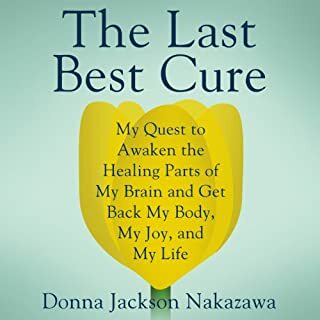 By expertly treating herself as both journalist and subject, the reader gets up close to Nakazawa's story (giving each chapter pace and momentum) while avoiding sentimentality and learning about some important practices and mindsets for healing. Good god, this is one of the most riveting, disturbing, and ultimately rewarding books I’ve ever read. The story huddles around four college friends – Jude, J.B., Malcom, and Willem – but comes sharply into focus on Jude St. Francis, a physically beautiful and emotionally wounded man whose history of sexual and physical abuse haunts him so severely that thoughts of it hover over, and threaten to destroy, every good, every beautiful thing that ever happens to him in his life. 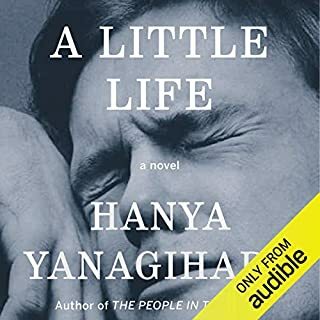 Jude’s back story, which Yanagihara weaves throughout in flashbacks, include such malicious, hurtful acts of abuse that I had to set the story aside for long periods to process what was happening – and even that such things could happen. Despite this, the reader gets to know the orphaned adolescent Jude as a smart, physically agile, resourceful, and capable boy who knows how to bake, sew, and clean; who is sweet-natured, respectful, hard-working; and who secretly longs to escape his abusers and go to college. The present-day, adult Jude echoes this dichotomy: He soars in his legal career to become the youngest partner in the history of Rosen Pritchard and Klein, garnering a reputation as a ruthless, steely corporate litigator. He makes more money than he ever dreamed. He purchases and renovates a beautiful New York apartment. But at night, he slices his arms with razors to keep at bay the shameful thoughts or “hyenas” that circle him constantly, viciously. The immediate, searing pain of his careful, ritual cutting snaps his attention back into his body and to the present moment where he is safe from past abuses. My rewards throughout this tragic story were the glimmers of hope when Jude lets himself love; when he finally, painfully reveals his sorrowful story to Willem, his closest friend and deepest love relationship; and when Jude slowly allows his former professor and late-in-life adopted father, Harold Stein, into his heart, despite Jude’s notion that nobody could truly love him. I also enjoyed the themes that anchored the story: mental illness (What is it? How is it defined? ); friendship, upon which Yanagihara reveals many satisfying insights; food and cooking, which become an entertaining leitmotif; and art, particularly J.B.’s retrospectives, which ground the present day story in the deeper meaning of it all. 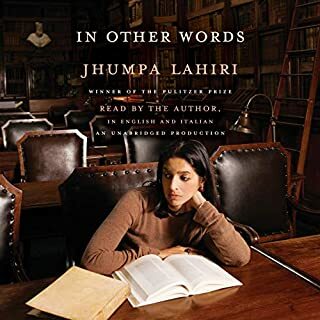 As a journalist who has studied a foreign language, lived abroad, and spent considerable time in Italy, I enjoyed Jhumpa Lahiri's exploration of the themes of exile and finding a new voice in her writing through another language (in her case, a third). 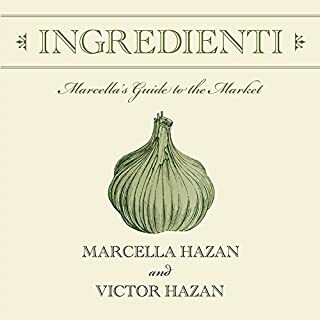 This slim volume, translated from her new-found Italian to English, her language of core competency, reflects the often staccato style of a foreign speaker, which felt repetitive at first. That's forgivable, because Lahiri makes you co-pilot on her journey to navigate her way through this new, more romantic language, one that makes her feel more at home and creative, but one in which, to her own admission, she still struggles. What I missed from this book was more of her story (she moves her family to a new country and rarely discusses those struggles or sacrifices). I also craved more details of her new surroundings, the gorgeous city of Rome, which she leaves mostly to the reader's imagination. This book, which seems to be part journal, is almost more of a lengthy essay fit for a literary magazine than a book-length memoir. I was shocked when, three hours into my listening, the book ended. For the remaining three and a half hours, she reads the same book in Italian (a beautiful Italian, but still Italian)! Wow, this book sneaked up on me. Philip Roth traces the life of a single, anonymous ‘everyman,’ starting at his funeral and then, as if rewinding a videotape, bringing him back to life to reveal the man’s lifelong health problems and big-brother envy, lustful escapades with a hot Danish model at the peak of his advertising career, and the heartbreaking loss of his one good marriage. In the end, we see a humble, resigned, observant, willing, stubborn, sad, mentally capable man still filled with so much love (and lust) but few people left to give it to. I judge great fiction in part by how much I end up thinking about my own life and the lives of the people around me while reading it. I was often forced to pause while my mind careened off to my own thoughts and life, and the lives of my aging parents. 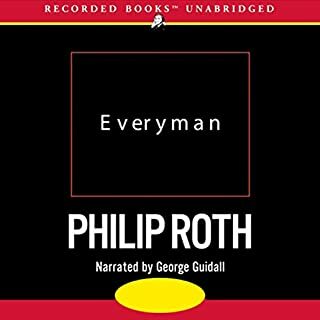 Despite so many poor choices, Philip Roth’s 'everyman' is a decent man, but in the end, decency is not enough. Death, decay, and uncertainty still await us all. It kills me that Audible does not have an unabridged version of this book. The cuts are rough, disrupting the storyline, and the sound quality is poor (including some "air" or room static sound). What kills me is that these flaws disrupt Mary Karr's immensely satisfying narration of her absolutely phenomenal and most cherished memoir. 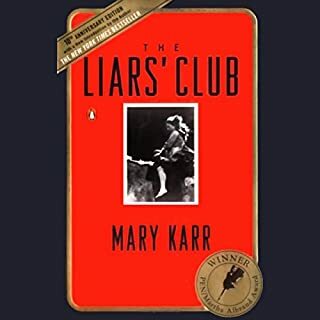 I beg Mary Karr to read this entire book again, and Audible for producing/distributing, for listeners today and in decades to come. Throughout this giant, sometimes bloated, novel, I kept wondering, what will redeem this epic of misfortune? There is little reward for the main character of the novel within the novel, the narrator’s grandmother, Susan Ward, who suffers a volley of hardship and losses. The narrator, Lyman Ward, a grumpy, legless retired professor, circles decades of his grandmother's pained life like water to a drain. And yet still, the language brims with colorful imagery and physicality, and the story lines, though small at first, tug and whip like the reigns of a stubborn mule, hooking the reader through the plodding landscape of a rugged Western frontier, full of promise and disappointment. 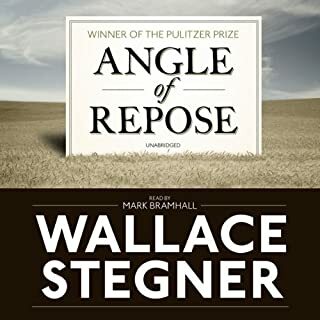 I hated to like this book and hated Wallace Stegner for sitting me down like a child, restless and impatient, so he could tell the story in his own, old-man way, taking his time as if in creaky rocking chair with nowhere to go, puffing on a cigar and exhaling smoke ring vignettes for my eyes to follow and then watch disappear. There are no traditional story arcs. No tidy beginning or end. There is the narrator, a man who has loved and lost much, longing to understand his own life through the calamities and misfortunes of his ancestors, hoping that through them, he can find meaning and courage to keep living. Sigh. Did I love it? No. Did I appreciate its immense beauty, language mastery, and emotional depth? Absolutely. A master storyteller with an immense legacy! I haven't read Maya Angelou since college. At the time, I enjoyed her poetry but I didn't fully appreciate her full talent and legacy until reading this memoir, more than 20 years later. Angelou imbues each moment with a tender exactness and a poet's mastery of language. As she gallops from early childhood to young adulthood, ending with an astonishing plot twist and new beginning, she held me captive to her every move. What a gift to the world that Maya Angelou read her own work. Her voice, which occasionally breaks into song, brings these stories alive. 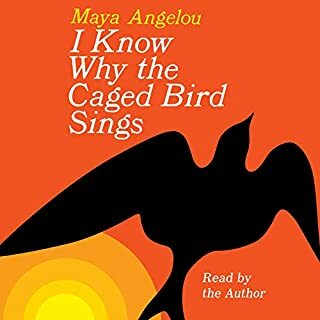 At times horrifying; at times laugh out loud funny, "I know Why the Cage Bird Sings" carries forward her immense legacy, which shines so bright.